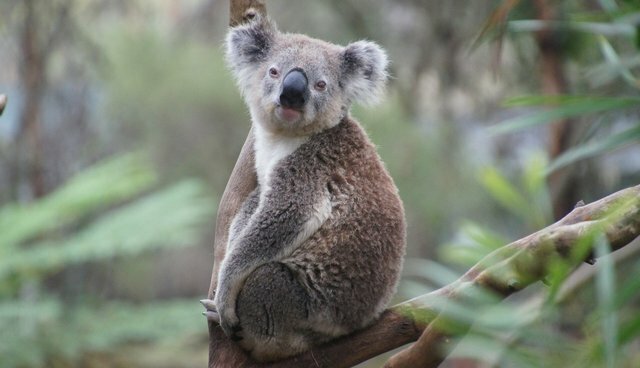 On Thursday evening, wildlife workers in Melbourne, Australia were called out to help a koala which a motorist had seen injured on the roadside after having been struck by a car. By the time rescuers got there, the frightened animal fled high into a tree, so they dispatched firefighters who arrived with a ladder-truck to try to bring him down to safety. But as the fire crews tried to move him from his perch, the koala slipped and fell 30 feet, landing limply in an outstretched tarp below. An animal caretaker on hand, Michelle Thomas, quickly assessed the koala's condition and found that the animal appeared to have died moments earlier. Although she'd never attempted CPR on a koala before, Thomas knew she had to do something. She started performing mouth-to-mouth and mouth-to-nostril resuscitation on the lifeless animal while firefighters gently compressed his chest to revive its heartbeat. "With dogs you have to shut their mouths and breathe into their nostrils. I figured it worked the same way," she told the Herald Sun. "I wasn't gonna lose a fairly healthy koala for this reason." Amazingly, after a few moments, the koala sprung back to life. He began growling at his rescuers, which Thomas knew was a good sign. "He's not showing any signs of broken bones," says Thomas. "He's one very lucky koala." Veterinarians say that CPR isn't often successful on animals that have gone into cardiac arrest, but it's still a skill worth knowing as a last resort to help a dying pet. To learn more about performing this procedure, visit PetMD for some life-saving tips.